The sci-fi miniaturs game, Breachstorm, is looking to get a new faction. They're called the Volucrid Host, and they're nasty. I mean, they're giant bugs. That's kinda gross. Who wants bugs all over everywhere? This new faction will hopefully be funded when they hit Kickstarter at the end of next month. Breachstorm: Reloaded is a new Kickstarter campaign that will introduce Breachstorm's second wave of miniatures. The campaign will focus on an entirely new faction; the Volucrid Host - an insectoid, alien swarm - but will also include a new mercenary Contractor character for any faction to use, new units for each of the existing factions and new components for the game. 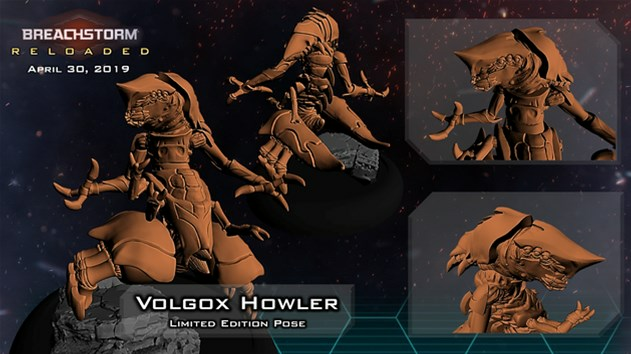 In addition to new models, Breachstorm: Reloaded will include two new limited edition miniatures that will only be available during the campaign, including the Volgox Howler pictured above. Breachstorm: Reloaded will launch April 30th, 2019. Stay tuned for more reveals as we get closer to the launch date! Members of our partnership program will be receiving preview miniatures in the coming weeks.